In Library, use the menu command Library > Plug-in Extras > Open Directly. use the “…” button to set up the third party programs. Use the “x” button if you want to remove the third party program. A maximum of 6 editors can be set up. 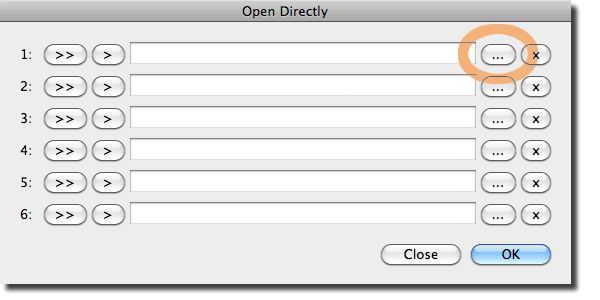 Use either the “>>” or the “>” button to send the selected files directly to the other program. If you have selected a single image, it makes no difference which button you press. ">>" sends the selected files to the other program as a batch, technically one long command string. In different circumstances you will prefer one or the other - a lot depends on how the other app works, and on what you want to achieve. Nikon Capture, for example, doesn't seem to care whether you send a batch or a series of commands - it just opens all the files. But email programs like respond differently, so ">>" sends a long command and attaches all the pictures to a single email while ">" sends one command per picture and generates one email per picture. Experiment!